It was the eyes I noticed before anything else. They pulled me in. 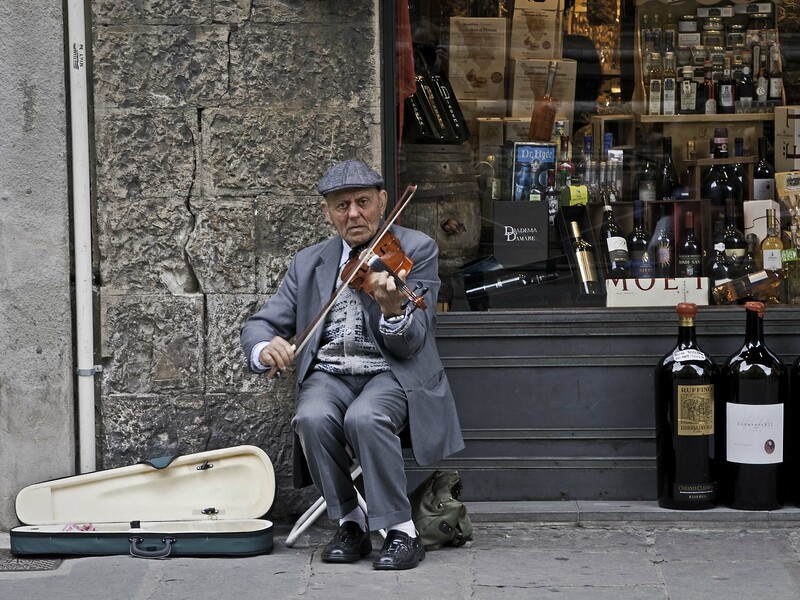 Walking along a side street in Florence I came across the violinist, encamped in front of a small wine shop playing for whatever coins people would share in exchange for some lovely music. I came across a number of street vendors on my trip through Italy. Many sold knock-off fashions, or odd gooey balls that would spat on the ground forming a face reminiscent of two fried eggs. Mildly amusing for two seconds, they merely became annoying with repetition. Though a face or two came to mind when I pictured an alternative destination than the ground. As evening descended, their target switched from the ground to the air. At times it looked like fireflies as many blue glowing balls floated gently back to earth. Street music was popular. In Venice we listened to dueling bands on St. Mark’s square from the Café Florian. Another time we came across a trio on one of our wanders. We spoke with them for a moment as they tried to sell us their CD, but guitar, violin and tambourine music is not high on our list. I can sympathize with their world of trying to sell digital music by the side of the road in this world of MP3 players. Oddly, the same trio seemed to be around every corner, though we were lost more often than not, so it could just have been us. But I swear we passed them in a narrow alley, each of us off to another destination. 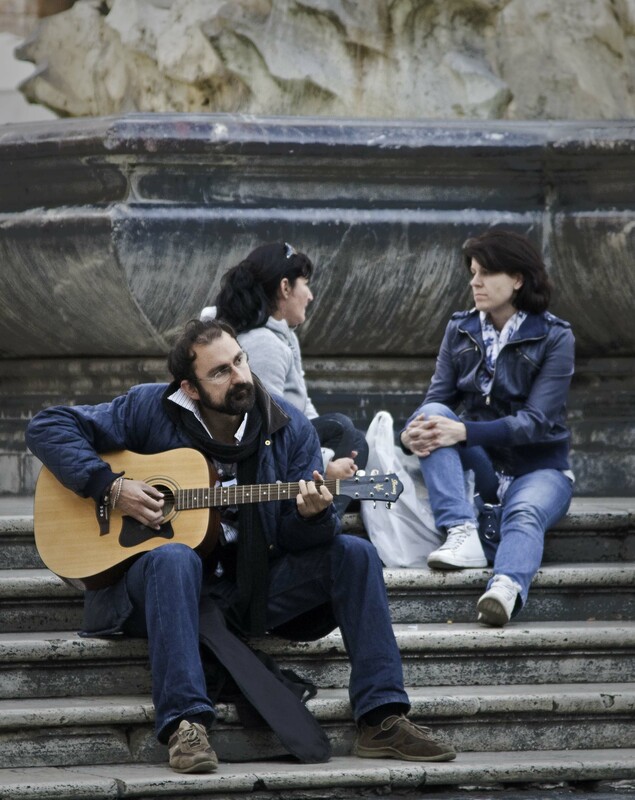 In Sorrento we met a solo guitarist on the main street who would sing as you passed by. His singing and what was merely strumming his fingers across the strings only caused us to speed up. Fortunately, he stayed in one place. 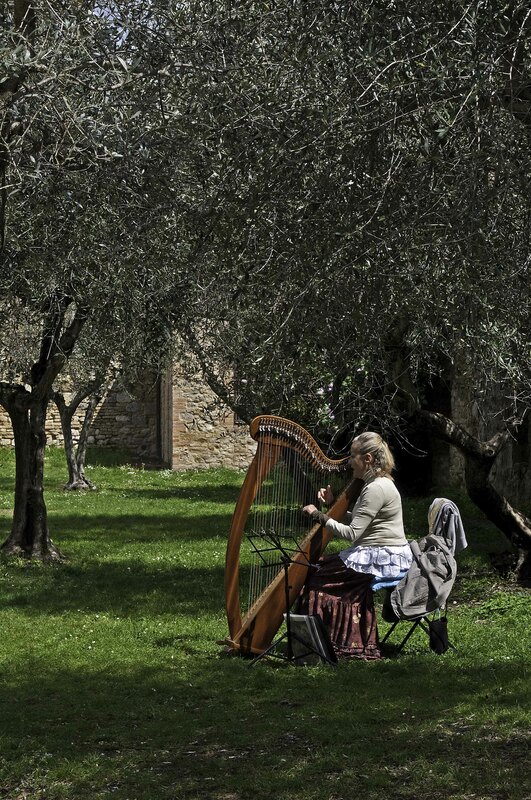 In San Gimignano, we listened to a harpist while strolling in an olive garden, followed by a glass of wine in the adjoining courtyard entertained by a guitarist and the company of a couple from Australia. Rome was more intrusive. Musicians come right into a restaurant and start playing. Usually there are two of them. 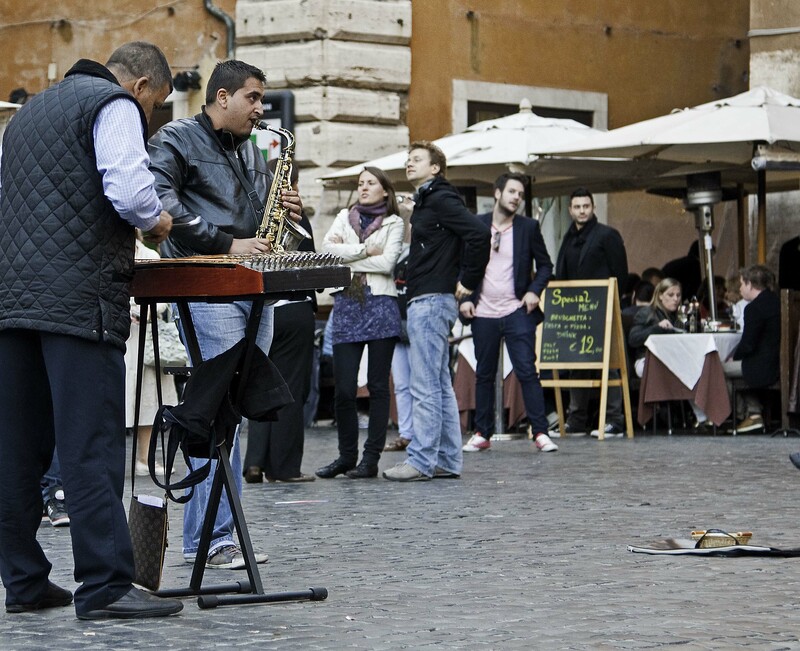 One would play an accordion or guitar and the other something to keep a beat, but his role was to walk around and collect money while the other musician kept playing. I found this form of extortion annoying, as I was a captive audience paying for them not to play, but to leave. 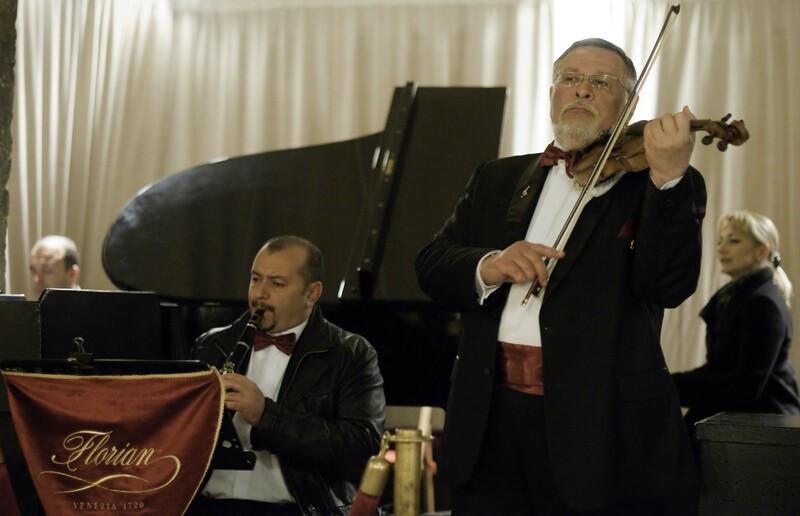 Someone selling roses often followed the musicians. However, everyone was always polite and there seemed to be an implied understanding that everyone is just trying to make ends meet. But the violinist in the street didn’t try to sell me anything. After his eyes I noticed his clothing; the gray suit, sweater and shirt buttoned up to the neck. His white socks peeking out between his shiny black shoes and his pants. Sitting on a collapsible stool, he played, staring at people as they walked by, his green violin case a place to show your appreciation for his music. No extortion. He was a musician. This entry was posted in Portraits, Travel and tagged Italy, Music, Musician, outdoor photography, photography, Rome, San Gimignano, travel photography, Violin. Bookmark the permalink.